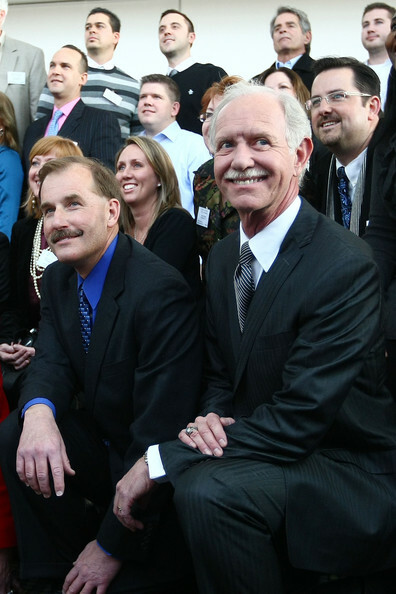 First Officer Jeffrey Skiles and Captain Chesley Sullenberger (R) pose for a group photo with the passengers of US Airways flight 1549 during a reunion to mark the one year anniversary on January 15, 2010 in New York City. The US Airways plane crashed shortly after take-off from LaGuardia Airport heading to Charlotte, North Carolina and floated in the water after crashing into the Hudson River in the afternoon of January 15, 2009 in New York City. Captain Chesley Sullenberger ditched the plane successfully in the Hudson River that day saving the lives everyone on board.